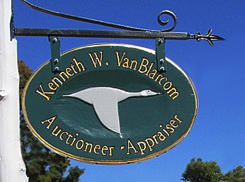 Kenneth W. Van Blarcom is an appraiser, auctioneer and purveyer of antiques and fine art who has built a valued reputation through knowledge, attention to detail and customized service. 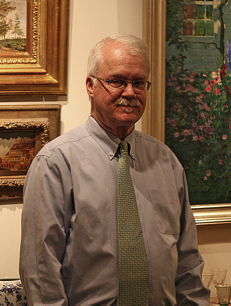 Van Blarcom's wide range of experience and expertise in appraising objects of value and rarity involves a variety of collecting fields, including American, English and Continental furniture, American and English Silver, glassware, ceramics, paintings and fine art, oriental carpets, as well as decorative and contemporary design. What can we do for you? Phone or email today for a confidential conversation about your property! Courteous, personalized service is provided to individuals, companies and institutions, with initial consultation and advice offered without charge at our offices in South Natick, MA. Arrangements can also be made to meet with clients onsite for a written or verbal evaluation and appraisal. Our discretion is always assured. Never miss another pop-up sale — sign up to receive shop news and advance e-Notices. Or check out our e-Shop! Look for our sidewalk OPEN sign across from the Bacon Library on Rte 16 in Historic South Natick for our occassional Pop-Up Sales. Go green, buy local!